My first December post and it’s damn near to the end of the month. I’ve been slacking when it comes to blogging, tweeting and the like. However, there’s a good reason for that. As soon as I returned from my big North American trip I sat down and tried to rationalise what I’d learnt and how I should take the next step with the business. My planning application for our on-farm processing plant was in utter disarray. I’d expected to have had an answer to my application in October, but somehow the planning department had managed to ‘loose’ my application for nine weeks. Thankfully, I’ve had a lovely Christmas present and the approved application is sat here next to the laptop. However, getting the plant up and running is still a fair few months away, as with any application, there are a list of conditions and other than preparatory clearing work no tools will be lifted for another four months. One day soon, this will be a butchery. So, in the meantime I had to find myself somewhere to actually ‘make’ some stuff. This is where my ever suffering partner Liesel comes in. She suggested we turn the kitchen into a processing plant. She’s an absolute Saint. I’m filled with crack-pot ideas and she’s always there supporting me every step of the way. So our lovely traditional country kitchen is no more, scrubbed pine has been replaced with stainless steel. Environmental Health have been round for their inspection, my Food Safety Policy has been written and HACCP plans slaved over avoided for weeks and weeks. I’ve started small, a carcass arrived a few weeks ago and the animal was quickly turned into sausages, back bacon, streaky bacon and cured hams. They’re all in their little packages ready to be sent for microtesting. Getting to this point, weeks away from sales has been the most incredible experience for me. Twelve months ago, I made the decision to start the business, and though I’d been curing for the past seven years on-farm (and watching and helping my uncle do so for many years more) it wasn’t until this year that I actually started understanding some of the most basic aspects of meat science. I’ve barely slept this last twelve months, largely due to the ideas and knowledge coursing through my brain when it comes time for lights out. And I’m still learning, whether it’s from books, stories, advice or from actually making something. I’ve made lots of mistakes over the past year, but they’ve been brilliant, I’ve learnt so much from them. The next step is the exciting part, I’m awaiting delivery of a new drying chamber and once I’ve had my test batch processed and microtested, if all goes well my first sales of snack salami will be hitting the Farmers Markets of South Wales from late February. Curing and air drying is projected as some kind of dark art, but it doesn’t have to be. Having come from a home curing background myself I’ve made some pretty good salami and chorizo in a cold draughty outbuilding. There’s plenty of people out there doing the same, check out http://chipsandbeans.com/ and http://adventureswiththepig.wordpress.com/. However, the challenge these past six months has been to create a consistent product. Following that whole supplychain, from the type of pig, the way it’s kept, the size, age, the feed, the way it’s slaughtered and through to every aspect of processing to ensure that I can make the best quality product with the best ingredients and that it’ll taste pretty close at each batch. Let’s hope there’s plenty of people out there wanting to eat my produce! 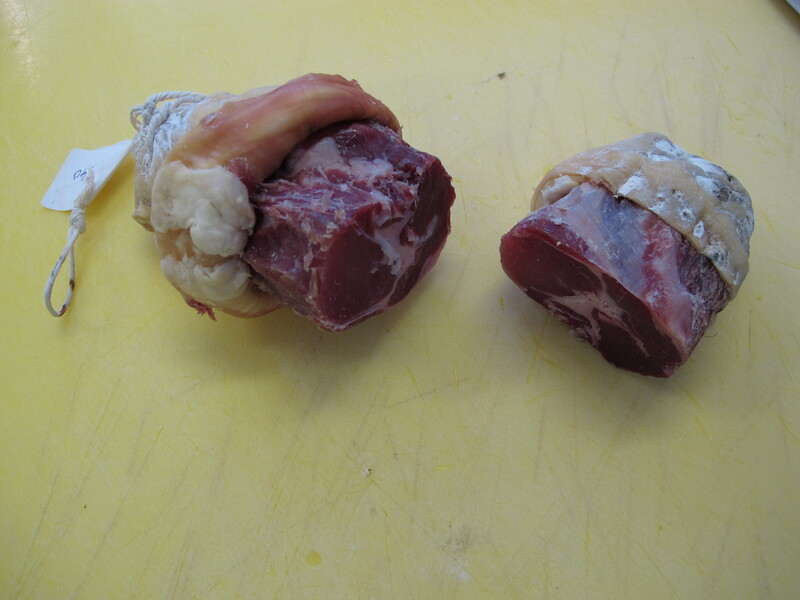 I’m continuing with my product development at the Food Centre Wales and another batch of Coppa, Lomo and Culatello will be salted in January. Again, if all goes well, my development work will be completed when the on-farm plant is built and I’ll be able to transfer production straight over. If you’re in Cardiff, Swansea or anywhere in between I’ll soon be doing a monthly delivery route. If you’re looking to buy some fully traceable Pedigree Welsh pork, bacon, sausages, cured hams and salami, drop me an e-mail – info@charcutier.co.uk. A belated Merry Christmas to you all, and a Prosperous New Year! 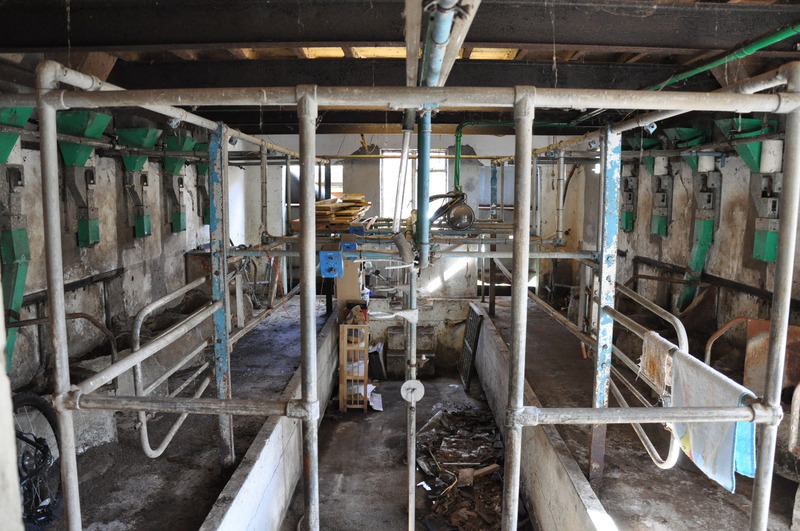 Hi Bob, very inspiring, long time since I milked in a herring-bone parlour too! Good Luck. Good luck Illtud. Nice move on he kitchen, couldn’t do that in the US at all. Hope to sample your wares someday soon.